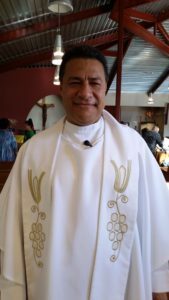 Father Kaitapu ties to the Sacred Hearts order goes back to 1998 when he came to Hawaii to join the congregation as a seminarian. He trained for the priesthood for the Diocese of Tonga and later took vows as a Sacred Hearts Father in the Philippines. 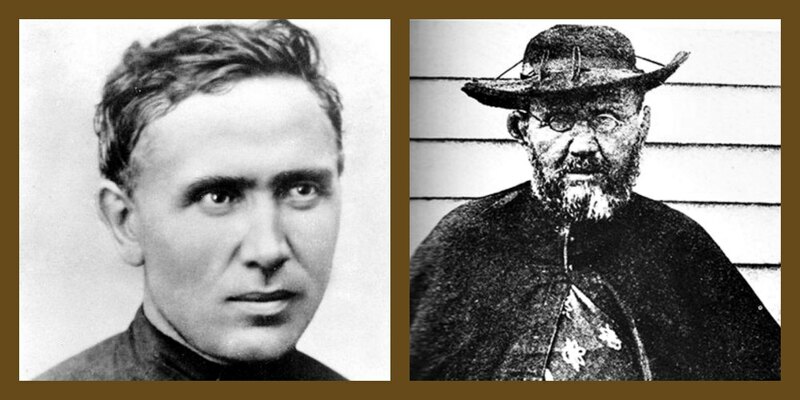 Father Patrick was born and raised on a small farm in the west of Ireland. Like Damien, he is a son of a farmer and was recruited by the Sacred Hearts in Ireland in 1962 and came to the Seminary in Jaffrey, N.H. in 1963. He was ordained in his homeland in 1969 and has spent most of his years of ministry in the SS.CC. parishes in S. E. Massachusetts. He also served for three years in the Bahamas. Father Patrick visited Kalaupapa in 2004, filled in here during the summer of 2006, and was installed in 2012. 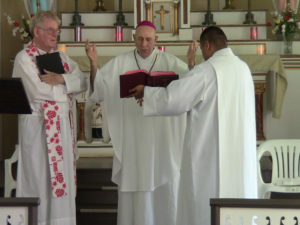 Father Patrick Killilea (left) was installed on July 11, 2012 as the pastor of Kalaupapa’s St. Francis Church by Honolulu Bishop Larry Silva (center). Photo by Mark Miller.